Val and I recently got a new car – a Subaru Outback. The 12 year old Subaru Forester was still doing ok, but it was time to get a new car with better safety features. However, the new Outback was a bit bigger – length and width. And since we’d used up a significant portion of our garage space for Tinkurlab’s workshop, I wanted to park the Outback as close to the garage door as possible to leave maximum room in front of the car to walk between the workshop and our house. What to do? Hang a tennis ball from the ceiling? Not for a maker! Time for a new project! Introducing Tinkur Park Assist, a project to help you park your car irresponsibly close to the garage door, with only inches to spare. Tinkur Park Assist is pretty simple, consisting of an ultrasonic range sensor to determine the distance between the wall and the car, a big LED for feedback about the distance of the car from the sensor, and an Arduino to make sense of it all. I initially used an IR distance sensor, but I found that an ultrasonic sensor works much better for the car which is highly reflective and curved. It seems accurate to within an inch. I also had the opportunity to design my own housing for the project to hide all the messy wires and electronics. I chose to 3D print the housing, which was much easier vs. previous housings that were constructed of acrylic milled with a CNC machine. 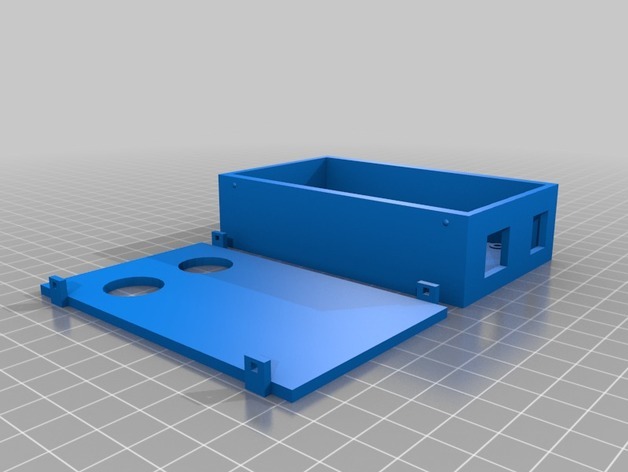 After a few iterations of the 3D model design, I was able to create a housing that has openings in all the right spots and has an easy to add / remove snap-on lid. Tinkur Park Assist continuously monitors the distance between the ultrasonic sensor and whatever is in front of it. If the distance hasn’t changed in a while, the LED light turns off. When the distance starts changing, the LED light turns yellow as the object in front of it gets into close range (< 5.5 feet in this case) and turns green when the object is in the ideal range (30 to 38 inches from the sensor in this case). If the object is too close (< 30 inches), the LED turns red. Tinkur Park Assist also saves the 3x last distance values, using the median value for making decisions to reduce false positives from random fluctuations in data (ex. a person walking in front of the sensor). Increasing the sampling rate for faster LED changes. Tweaking the “no motion detected” logic and thresholds to make sure the LED is off when a car isn’t approaching. Check out the docs and source code at https://github.com/TinkurLab/TinkurParkingAssist. Check out the 3D model at https://www.thingiverse.com/thing:2836728.